I guess it's not a secret anymore that I'm not completely thrilled with my kitchen. If you pay attention, you probably sort of knew this already since I never show it on here. I have lots of ideas though to brighten it up. 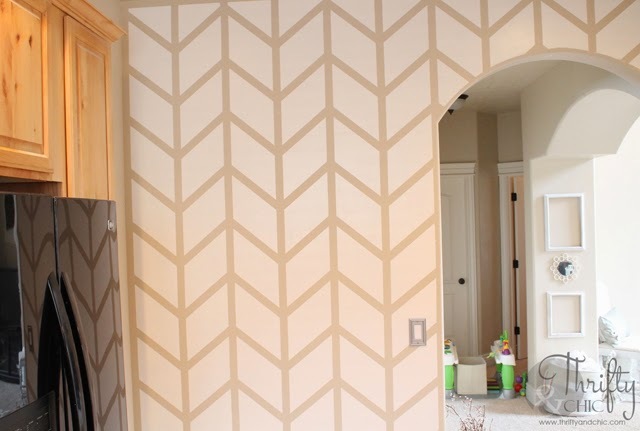 And today, I've partnered up with ScotchBlueTM Painter’s Tape to show you one of the projects...a herringbone pattern accent wall. Plus, this totally was out of my comfort zone but I wanted something more than just a white wall. 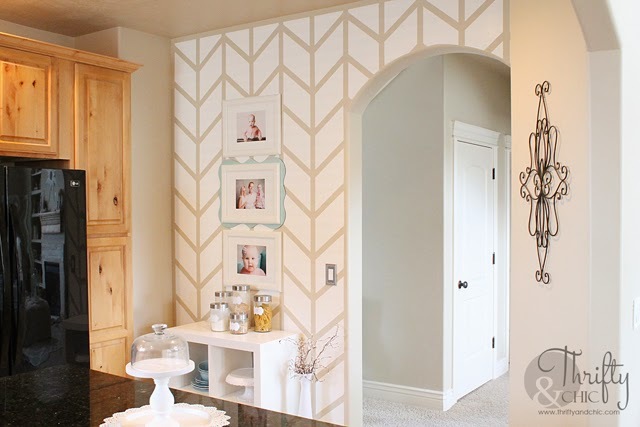 And I absolutely love herringbone patterned anything so I thought 'why not?'. If this was out of my comfort zone, you can only imagine how my husband felt about it lol. I made sure to do it while he was gone. When he came back home and saw the tape and paint laying around he was like "do I even want to know?" I tell him daily he married the wrong person if he doesn't like change or the idea of painting anything. 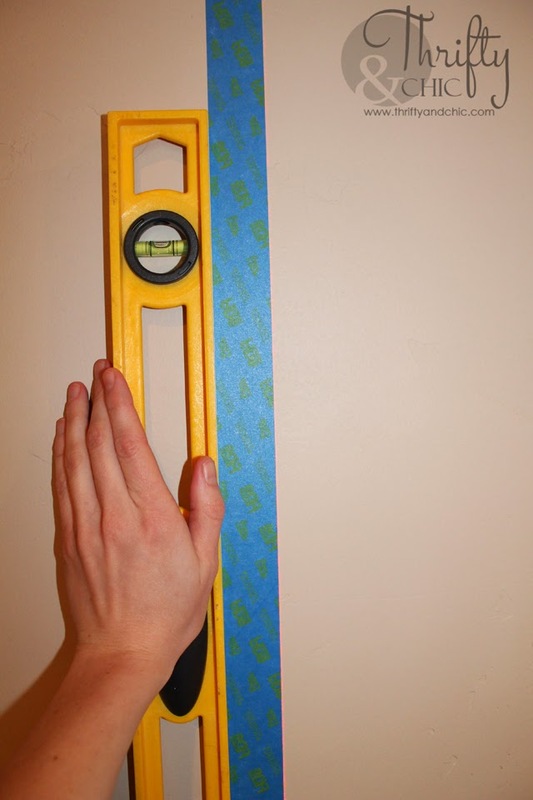 Ruler -if your level doesn't have one. 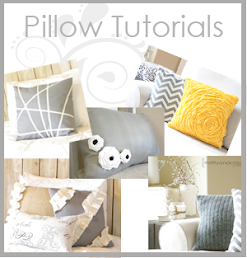 Step 1: Find a starting point on your wall. I chose mine to be right in the middle. I then grabbed my laser level to mark the line where the tape should be placed. 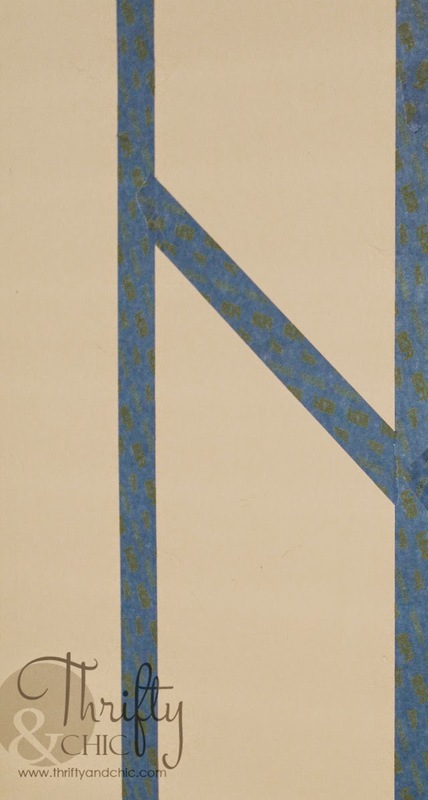 From there, I decided to make the parallel lines 8 inches apart. 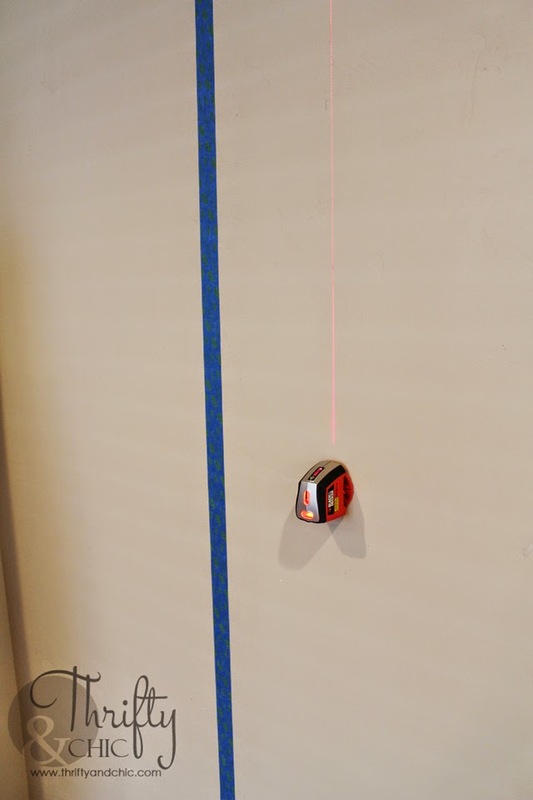 I did the same thing with the laser level and used the laser as a guide to place the ScotchBlueTM Painter’s Tape. I did this for the whole wall. 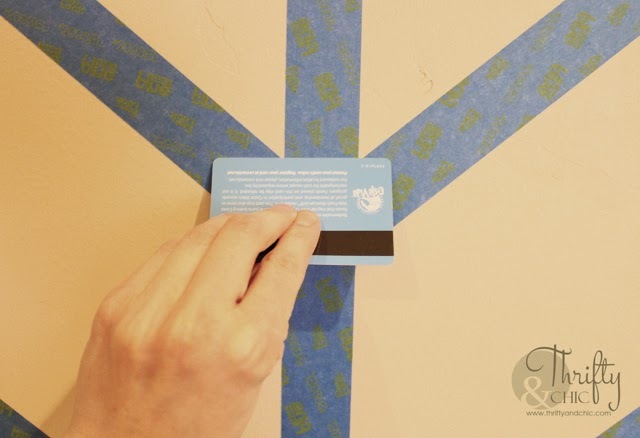 Step 2: Decide what angle to put the connecting tape. I just picked some random angle that I thought looked good. From there, I decided that each of these lines should be 8" apart also. No reason, just thought 8 sounded good. 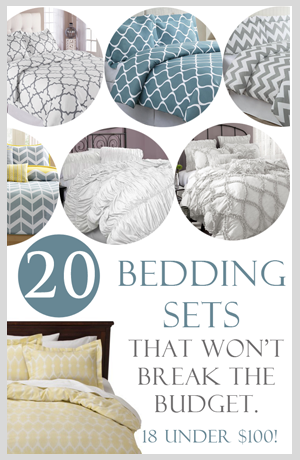 If you want a thicker pattern, then do more, or a smaller pattern then do less. 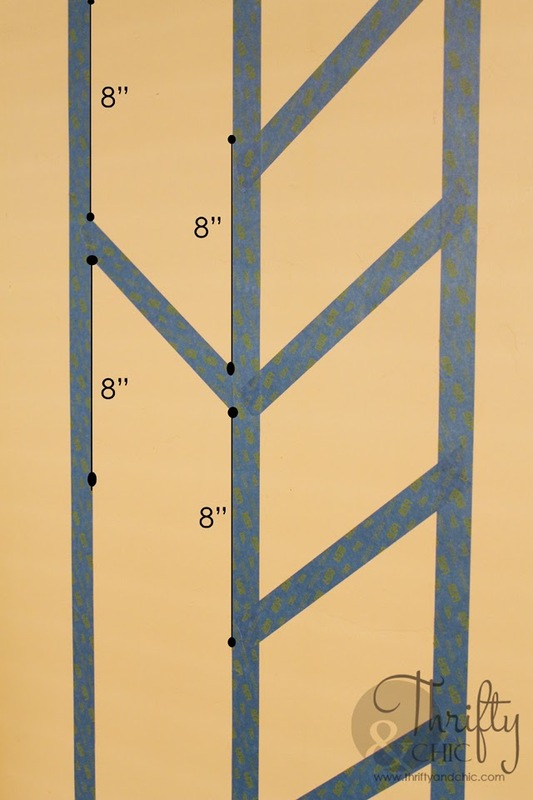 I measured up from the top of each intersecting angle 8" and created a mark. I did the same from the bottom, measured 8" down and marked that. This is where the next pieces of tape will go. Do this all the way up and down the wall. Step3: Now to get the other rows done. 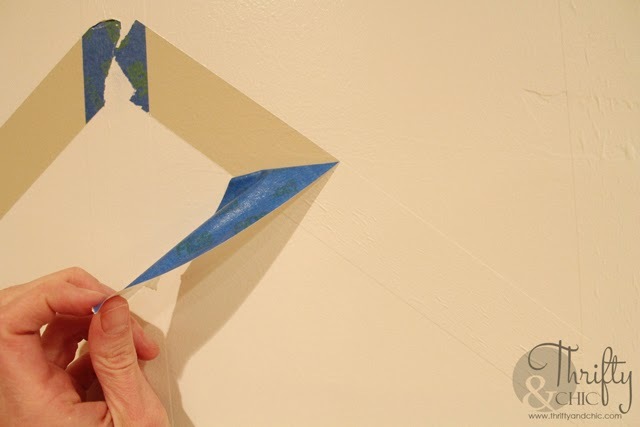 To start, find one of the intersections from the vertical and angled pieces of tape. 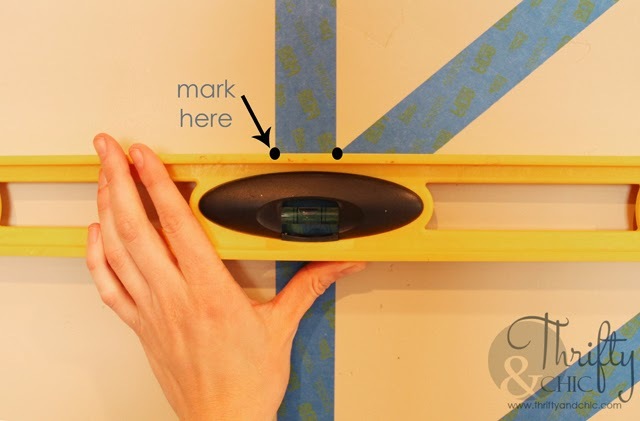 Place your level on the intersecting mark and then on the opposite side of the vertical tape, place a mark. This is where the tape will intersect on this row. Remember, this should be 8" between every one of these sections.If you did the above steps correctly, they should already be 8". 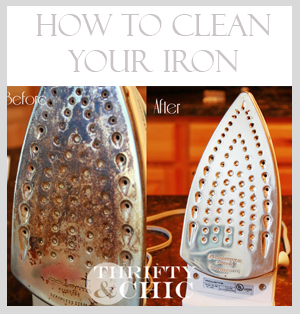 Now do this all the way up and down every row. 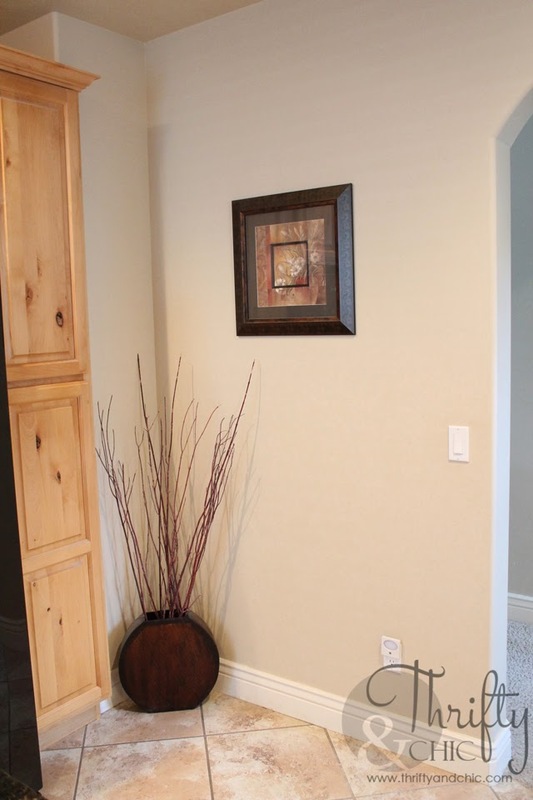 I decided to frame the wall essentially be taping the top by the ceiling and bottom by the baseboards. 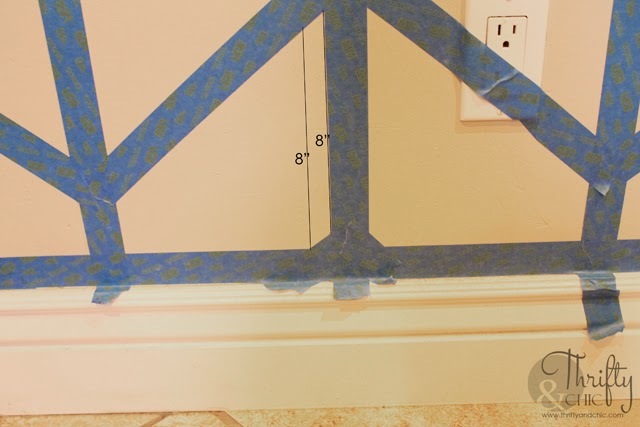 If you need to add some angles, but don't have enough room where they will connect to the next piece of tape, just remember that it will be 8" away from every mark (see below illustration). 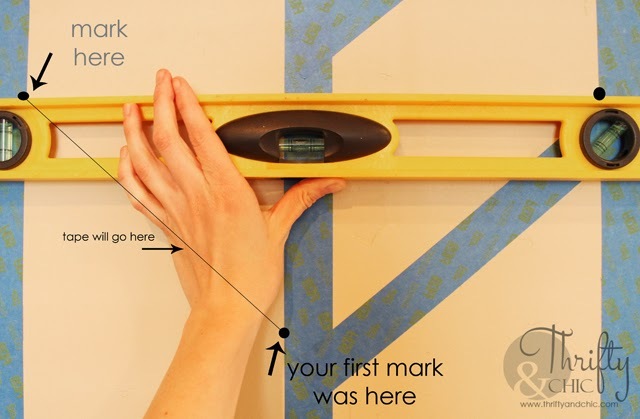 So, find your first mark, 8" away from the intersection of the above or below piece of angled tape, and then go about an inch inwards from that mark and find the new 8" mark. As long as you have two points, you'll be able to get your angle now matter how close the points are. 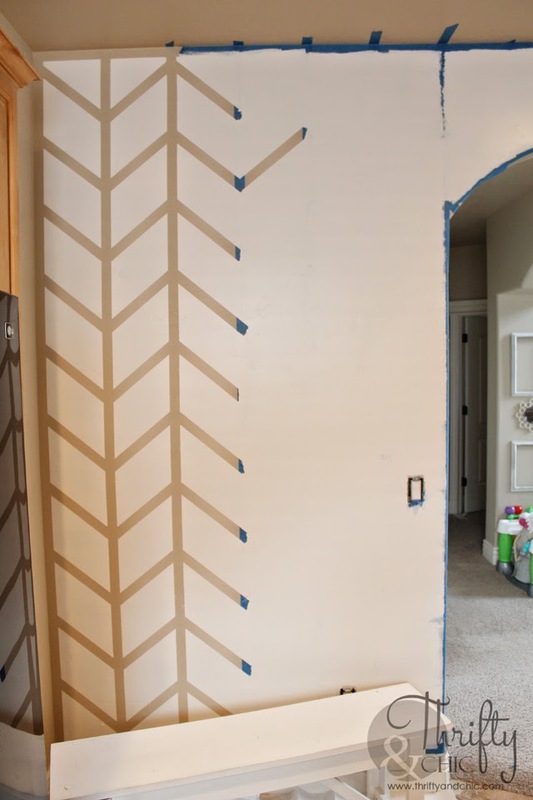 Step 4: I had a really bad experience once with some other painters tape. I pressed it on real good and painted, and then when I pulled off the tape, the paint seeped soooo bad. It was horrible and ruined all my molding that I was trying to seal it off against. So, I like to take extra precautions :) I decided to take a card and just go over each piece ensuring that it was on the wall completely. Now stand back and admire your work. It's a true work of art :) I was hesitant to even start painting this, it took so long to do, so I just sat there and stared at it for awhile lol. Step 5: Paint. I tried to stay in the little 'boxes' but really once I started going, it was useless to try to stay in the boxes. 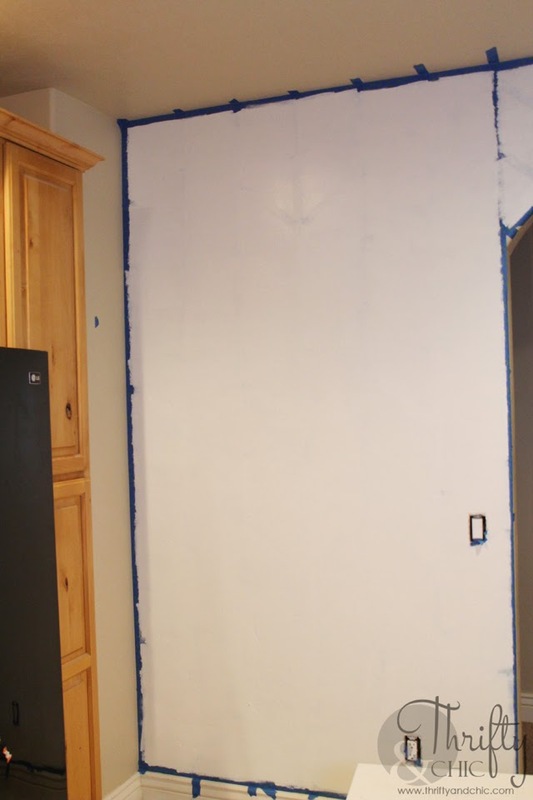 So, I essentially ended up painting the whole wall. I used 3 coats of paint for this. I can't get over how this looks. I think this is one of my most favorite projects to date. You have no idea how much this helps this kitchen. It brightens it up and adds so much interest. My husband thinks it looks like a construction zone...as usual, he's not a fan of it. I knew it would be out of his comfort zone :) That's why I do these things when he's not around lol. It really tied it into the rest of the house. 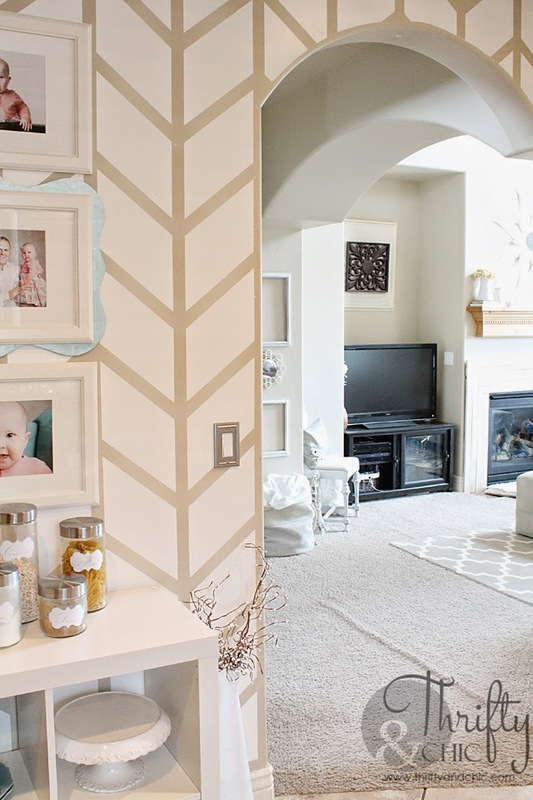 I love the pattern play from the herringbone wall to the trellis pattern on the rug in the living room. The flow from this wall into the living room is perfect now also. It was sooo boring before. So boring. This took a day to do, mainly during naps and extra moments of freedom. You can probably get it done in a few hours if that's all you are focusing on. I can't wait to get started on some more projects in here! 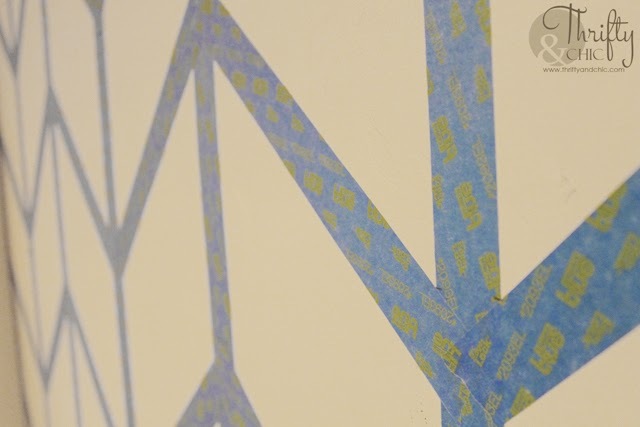 I used ScotchBlue™ Painter's Tape for Multi-Surface with Advanced Edge-Lock™ Paint Line Protector #2093EL (green core) and am happy with my results. 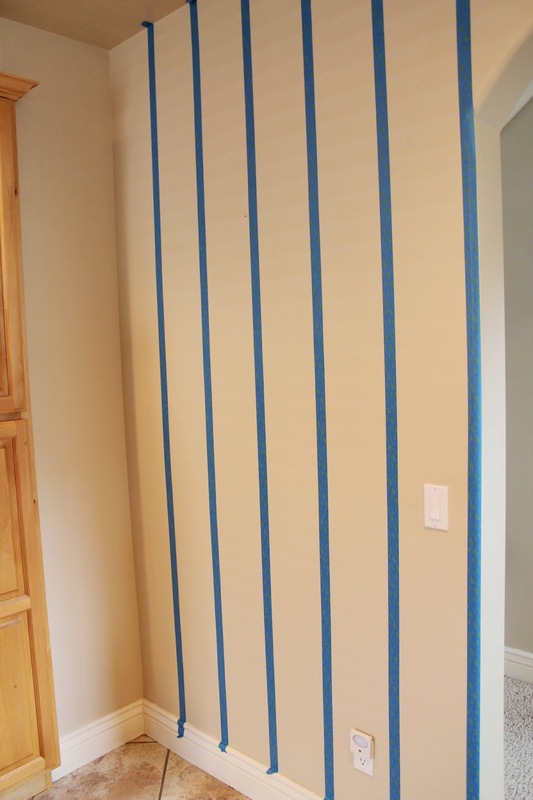 ScotchBlue™ Painter's Tape Advanced Multi-Surface is ideal for baseboards, trim, metal and glass. 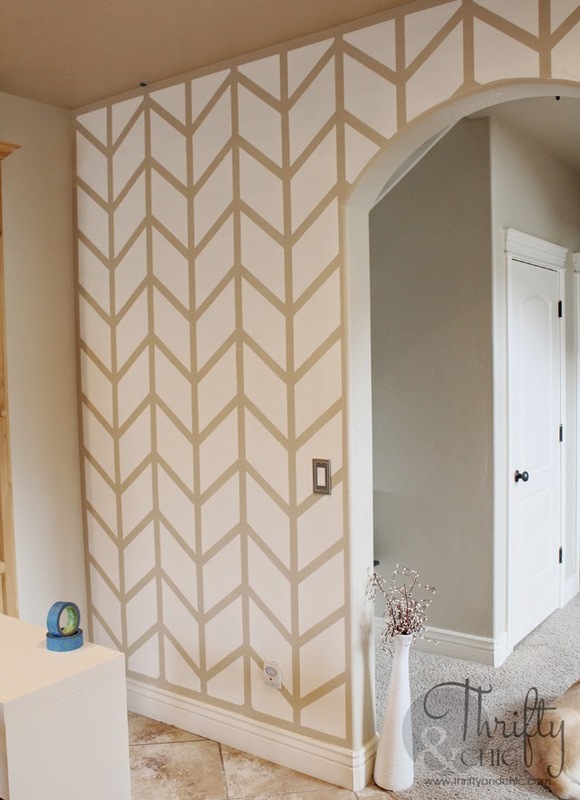 You can get even better results painting wall designs, accent walls and stripes by using ScotchBlue™ Painter's Tape for Delicate Surfaces with Advanced Edge-Lock™ Paint Line Protector #2080EL (orange core). 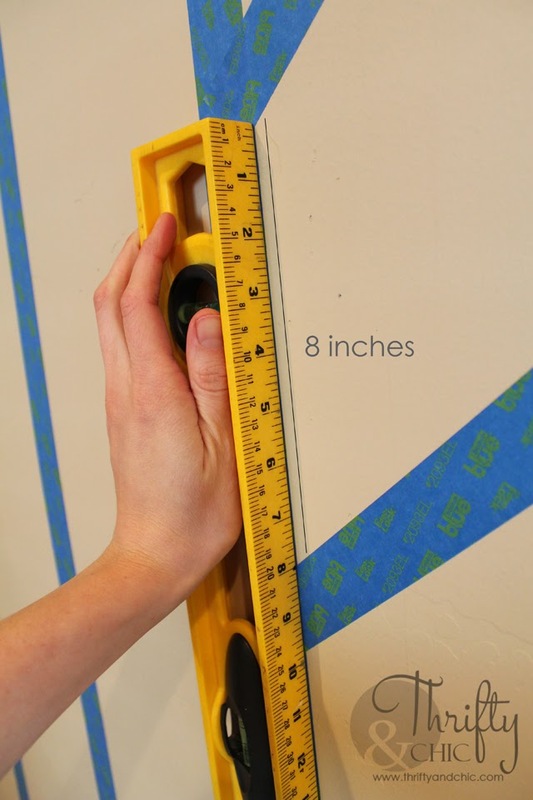 ScotchBlue Painter's Tape Advanced Delicate Surfaces™ is designed to provide super sharp paint lines on smooth, delicate surfaces like walls, cabinets, wood floors and freshly painted surfaces (24 hours old). 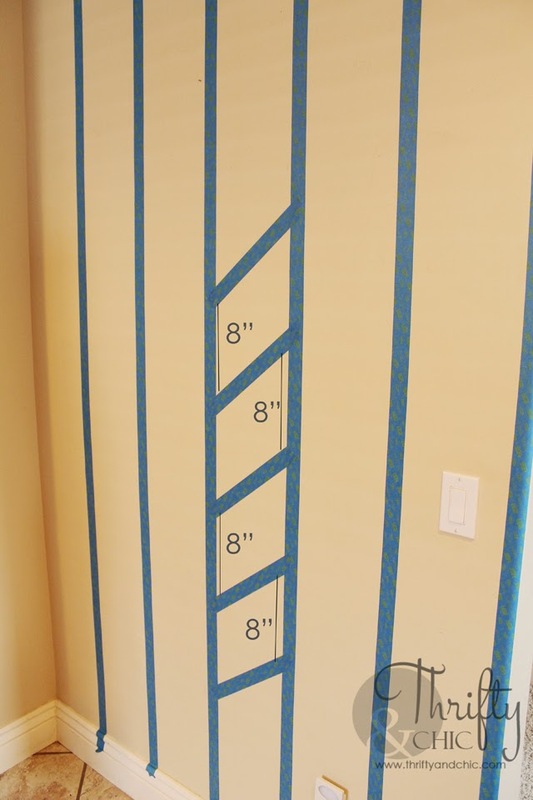 Enter the Home of ScotchBlue™ Painter’s Tape Contest at www.scotchblue.com/homecontest now through July 15, 2014 and you could win $5,000 to put towards a home makeover! The first 500 to submit an eligible entry will receive one (1) roll of the new ScotchBlue™ Painter’s Tape with Advanced Edge-Lock™ Paint Line Protector! Contest open to legal residents of the U.S. and D.C. (excluding AZ, MD, NJ, ND, TN and VT), who are 18+ (19+ in AL & NE and 21+ in MS) at the time of entry. Void where prohibited. 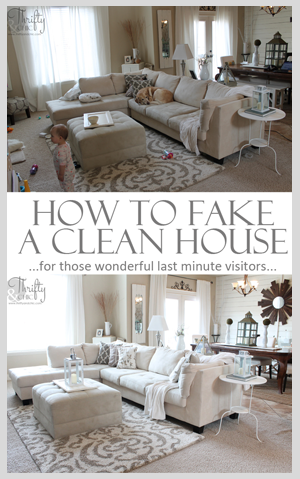 Enter from June 2, 2014 at 12:00:01 a.m. CT through 11:59:59 p.m. CT on July 15 2014. All contest communications, entry/judging criteria and details subject to the full Official Rules. Sponsor: 3M Construction and Home Improvement Markets Division, St. Paul, MN. 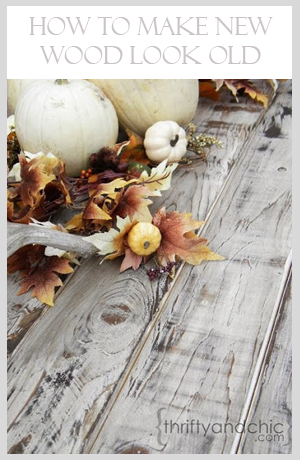 Be sure to check out ScotchBlue™ Painter's Tape Pinterest page , Facebook page and, Twitter page for more inspiration! 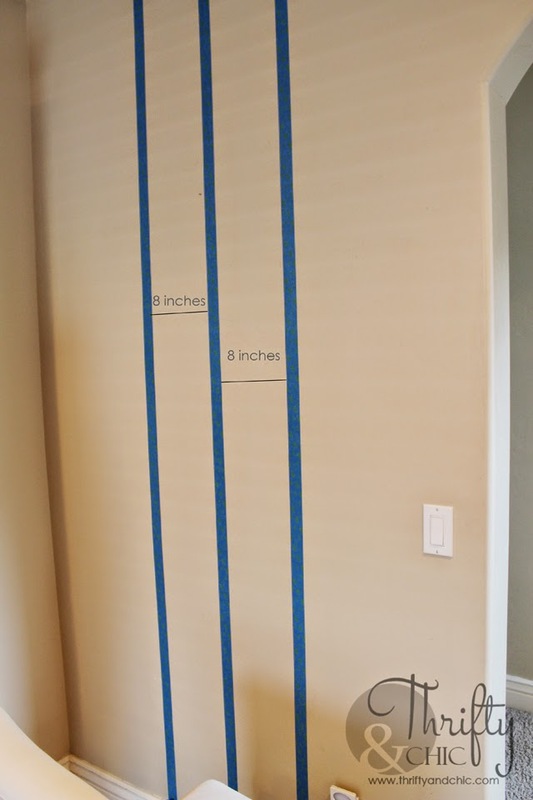 I am proud to be a 3M sponsored blogger, and, as part of my responsibilities, I get the opportunity to evaluate new products from ScotchBlue™ Painter's Tape. Opinions are my own and additional product used in the project were selected by me. I love the wall, wow, it is amazing. I love it! 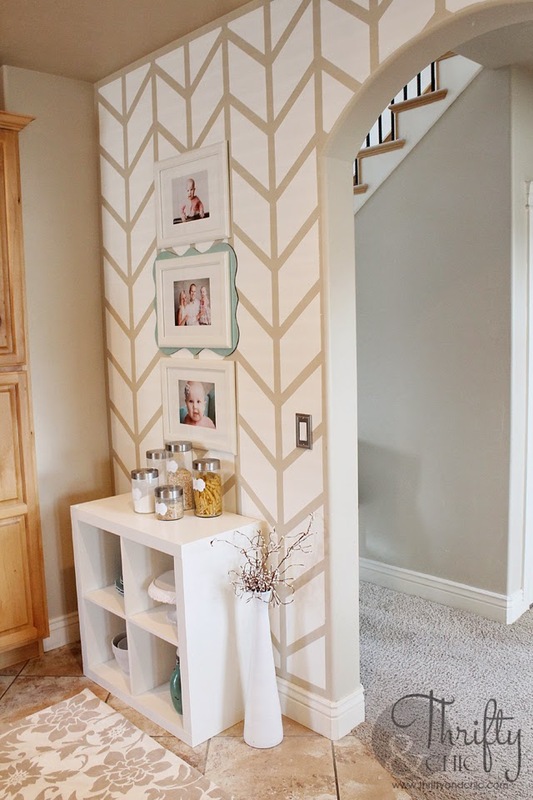 I just did the exact same thing in my hallway, but put my lines farther apart. 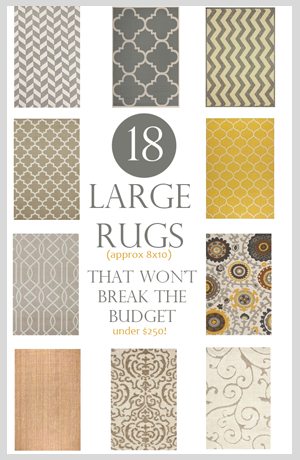 I wish I had seen yours first -- I like the smaller pattern better! Looks awesome!! 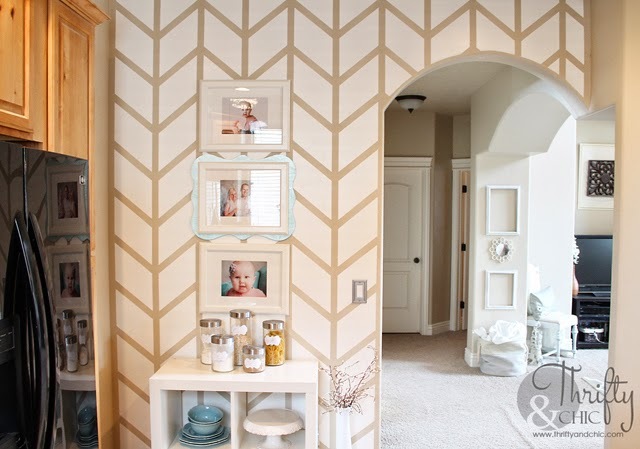 Love the pattern you choose! Looks fabulous! This is beautiful. I don't know if I have the steady hands to get the design right, but yours is perfect! 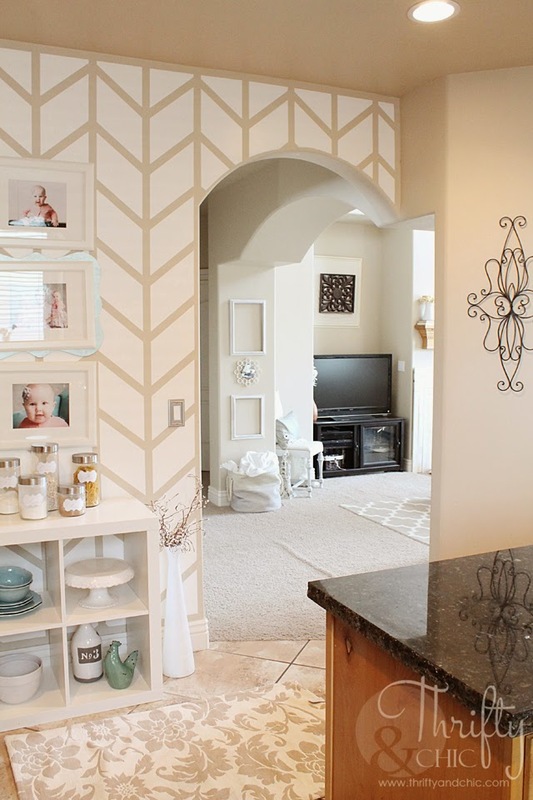 It looks so good as an accent wall too, almost like it stands out even more. And I love the pattern. 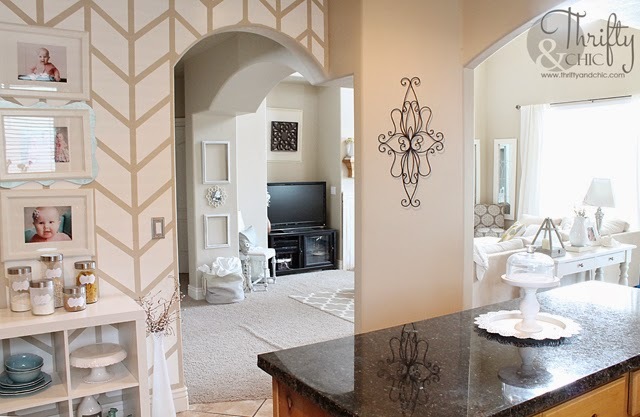 I was thinking about doing something like this for our living room, where I have one plain wall that seems to be screaming for something. 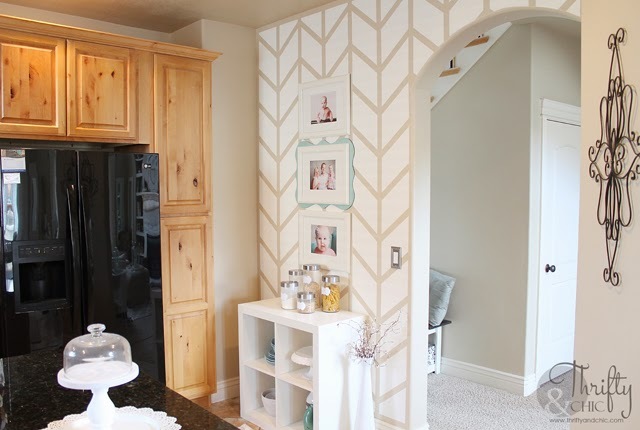 I was thinking about using removable wallpaper. My thinking is it will be a bit easier for someone not skilled in arts and crafts. What do you think? 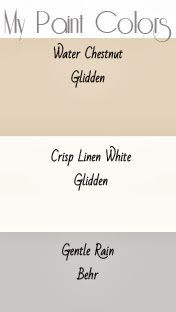 Very nice application, and perfect color combination. *High five! Wow! I agree not all painter tape is the same. You have me convinced this tape is great stuff! That's a lot of crisp lines. 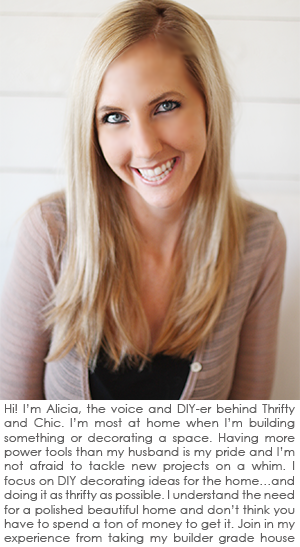 Thank you for the detail about how to get the measurements right for a herringbone pattern. 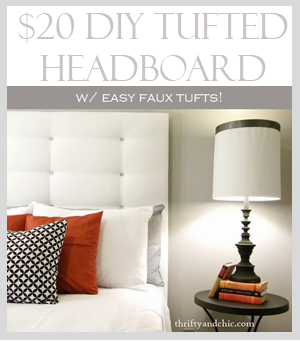 Stopping by from Thrifty Decor Chick. 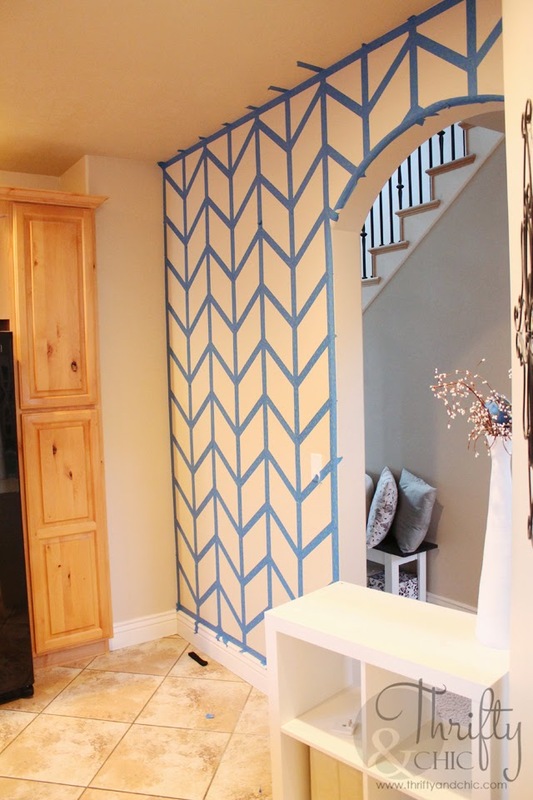 This looks awesome, and it was a great tutorial on how you taped the wall off. Great job! I love this! So chic! And I'm definitely investing in a laser level after seeing it in action. 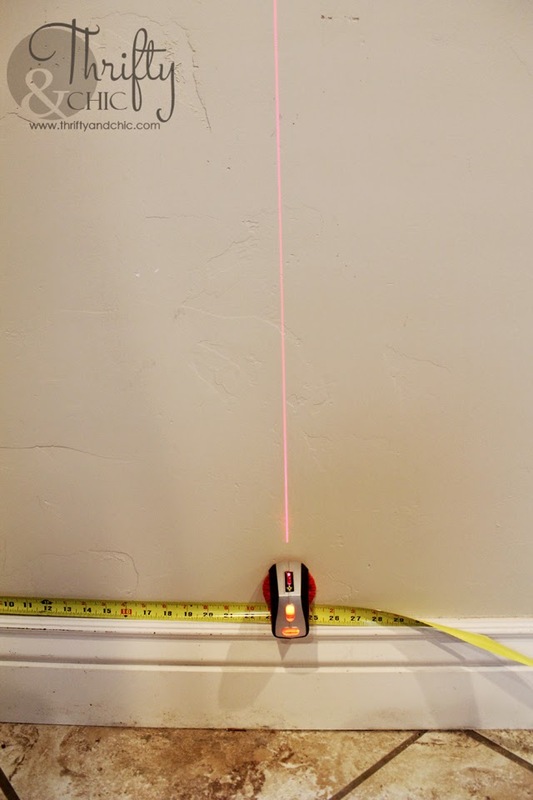 What type of laser level do you have? That is a great wall, I know it had to take a lot of patience and work but it came out wonderful. 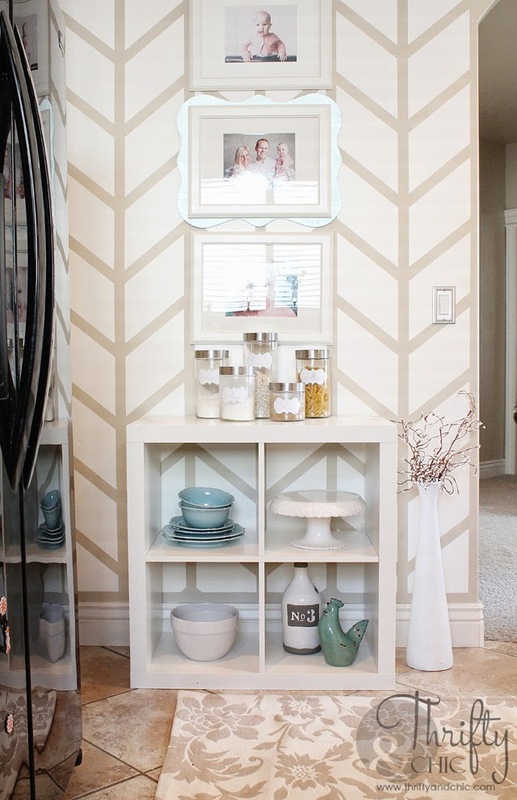 The only thing and I'm just helping from one blogger to another, that is a chevron design and not a herringbone. I attatched a link, don't worry, its a common confusion from about 90% of people and unless you were taught these little differences in design school or some kind of teachings, or someone lets you know the difference, its done on most pieces that it will be called one or the other and not be the true design. The difference is do small its hard to know, with the herringbone you just go down one on your next line from the center, see how easy it is to miss, but I am just helping a fellow sister out and how I look at it, I jyst gave you something for your next blog post, lol. You are truly a beautiful and talented woman and I'm so happy to see so many amazing talented young women with this kind of passion for design and creativity. You pat yourself because you are an inspiration for hundreds of little women coming up in this world, thank you for your beautiful and creative wall tutorial, I abolutely love it! This is better, I think I did something wrong on that link above, thank goodness we dont have to be perfect!